home - blog - Bed Linen, LinenMe Shop News - Once Again – Win a Luxurious Red Linen Bed Set from LinenMe! 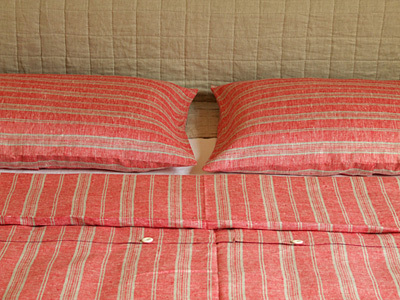 Once Again – Win a Luxurious Red Linen Bed Set from LinenMe! After having so many registrations to our Monthly prize draw to win a luxurious and gorgeous bed linen set called Jazz, we decided to repeat this prize in our September prize draw! So, should your still want this top quality linen bed linen set of a trendy design, register once again and maybe this time will be lucky for you! The proposal is valid till the 30th of September, 2010. Just to remind you – natural linen bed linen has many benefits and is good for your health. Linen is one of the most breathable fabrics, so it leaves no chances for perspiration. It is lightweight and absorbent – another reason you feel so good in the morning. Read more benefits of linen bedding here. And this is why bed linen made of linen fabric is worldwide considered to be luxurious. Linen bed linen is easy to take care after – just wash them in your washing machine at 40˚C and use your dryer on a cool temperature. It is common not to iron linen bed linens – they feel softer and cozier this way, but should you prefer ironing, do this when sheets are still damp for the best result. So, register with linenme.com or become a LinenMe fan on Facebook and win a set of stylish linen bed linen! Don’t forget to tell your friends! Moreover – LinenMe announces a special proposal for all linen bedding from LinenMe: buy any piece or bed set, try it, and should you be not happy with it, return it within 30 days from the day you received it and we will refund the amount paid. The offer is valid from till 31st of October, 2010. Colours perfect for my bedroom! this would look fab on my bed!!! love the design would love to win one!